Bread crumbs seasoned with fresh herbs are one of Francesco’s favorite touches for dressing up a variety of dishes. 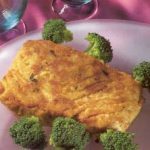 This handsome dish, with broccoli adorning the fish in its browned crust, could be served with mashed Parmesan potatoes. Steam the broccoli until just tender but still bright green, about 5 minutes. Refresh in cold water, drain, and set aside. Mix the bread crumbs with half the sage and coat the halibut with this mixture. Heat 3 tablespoons (45 ml) of the oil in a heavy nonstick skillet, add the fish, and saute about 5 minutes on each side, or longer if the fillets are very thick, until the fish is just cooked through. 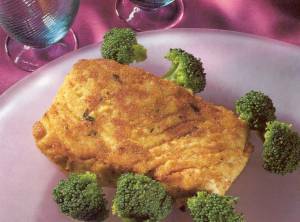 Remove the fish from the skillet, transfer to a serving dish, and keep warm. Add the remaining oil, the fish stock, and lemon juice to the skillet. Stir in the broccoli and remaining sage. Cook just long enough to reheat the broccoli, season with salt and pepper, then spoon the broccoli and sauce around the fish and serve.